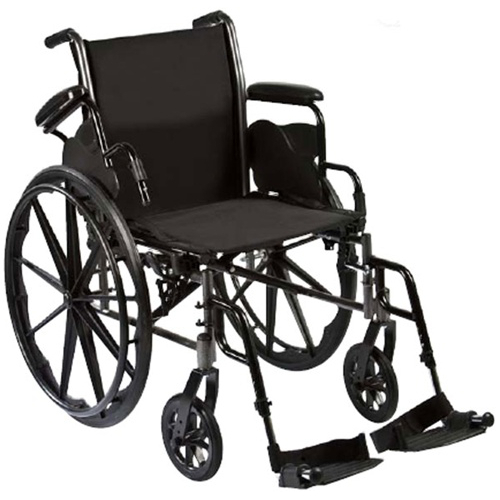 The Roscoe Medical Reliance III Standard Wheelchair offers all of the benefits of a standard K3 wheelchair with the added feature of removable flip back arms for easy patient transfer. The Roscoe Medical Reliance III Standard Wheelchair offers all of the benefits of a standard K3 wheelchair with the added feature of removable flip back arms for easy patient transfer. An updated frame style eliminates seat guides allowing for custom back support inserts and other chair accessories. Comfortable padded nylon upholstery resists mildew and bacteria. Composite wheels are lightweight and maintenance free. Weighing less than 36 pounds the Reliance III also comes standard with tool-free adjustable front riggings and easy push-to-lock wheel locks. Overall Width with Arms: 24" / 26" / 28"
Seat-to-Floor Height: Adult 20" / Hemi 17"